For the March 1 edition of the Institute of Oceans and Fisheries’ weekly lecture series, a trio of decorated science fiction authors, including two UBC alumni, converged at the Aquatic Ecosystems Research Laboratory Theatre. 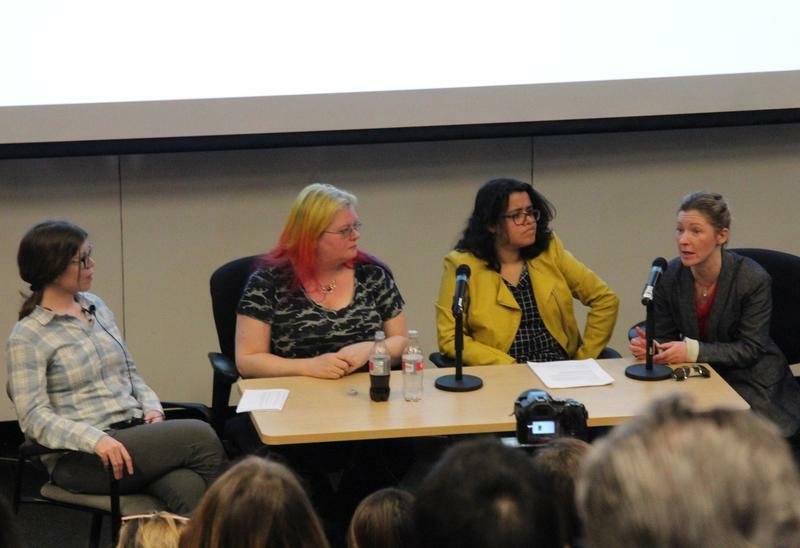 In a lively discussion, fantasy editor and science communicator Silvia Moreno-Garcia, zoologist and occasional Marvel Comics writer Seanan McGuire, and molecular biologist and zoologist Kristi Charish talked about science communications through fiction, interdisciplinary fascinations and bubonic plague controversy at this out-of-the-box event. “It’s sort of reconceptualizing how we view science,” said Kaylee Byers, the parasitologist and self-proclaimed ‘Rat Detective’ who moderated the panel. “Putting the Science in Science Fiction” was the brainchild of UBC’s Institute for the Oceans and Fisheries’ communications manager Katherine Came. A fan of science fiction since early childhood, Came felt passionate about science fiction’s capacity for sparking non-scientists’ interest in science and its implications for our daily lives. “I have too many [favourite moments],” said Came afterward, listing Seanan McGuire’s “freaky” account of having touched ebola for research as one anecdote that led to her excitement about the event’s success. This excitement was shared by the audience and palpable at the event — punctuated by the beeps and chirps of a video game console a kid had brought — which spoke to the authors’ multidirectional passions. Moreno-Garcia launched a fascinating, sometimes scandalous discussion about how advances in technology led to momentous shifts in the French Revolutions, which led to changes in fashion trends. Earlier, Charish declared herself “a prions fangirl,” a statement swiftly and strongly supported by moderator Byers. “I really liked hearing about the process of how they incorporate science,” said Byers, referring to the two main stances around science in sci-fi the authors took: building the story around an interesting scientific fact versus — or in conjunction with — peppering scientific facts of interest into a manuscript. When the time came for audience questions, the authors gave such comprehensive answers that there were only time for two, though these were salient. The first was an inquiry, on behalf of the asker’s father, about how the authors went about publishing their books. McGuire recommended going the hybrid route and publishing through large presses, small presses and indie markets in order to grant oneself the greatest flexibility and market strength as a writer. The second question was a bit more contentious: the asker wondered if the authors ever worried about muddying the truths of science by incorporating it into their fiction. Charish noted the importance of generating public interest in science, and pointed out that “if the science[’s] accuracy hurts the story — or conversely, if the science’s inaccuracy hurts the story,” then it has failed as both a narrative and a method of scientific outreach. “We view fiction as a very viable way to put your science within the hero’s dilemma framework,” said Byers, with Came noting that science communication is crucial for multiple reasons, including ensuring public safety.